Let’s say you’ve got beer-connoisseur friends visiting from San Francisco or London or Berlin or Brussels, and they ask if there’s a good place in Sacramento to go for a pint. If you send them to Capitol Beer and Tap Room, you won’t have to worry that Sacramento is going to come up short when it comes to great beer bars. Hidden in the back of a busy strip mall at Fair Oaks Boulevard and Howe Avenue, CapTap, as it is known to regulars, promises a world-class tasting experience seven days a week. More than likely, your pals will encounter multiple beers they never have tasted or even heard of, and they will engage with like-minded beer lovers working their way through an ever-changing tap list that is closely followed and much-discussed. Owned by Ken Hotchkiss and his life partner, Patti Aguirre, Capitol Beer has become a major force in the local craft beer industry, attracting serious connoisseurs and newcomers alike. The bar is so influential these days that it can help launch a new brewery’s reputation; if you can’t find a fledgling beer there during multiple visits, it probably means it’s not ready for prime time. “It’s safe to say (Hotchkiss) is really one of the guys who sets the bar, and he set it very high,” said Ken Anthony, owner/brewmaster at Device Brewing, who has made Capitol Beer’s anniversary beer the past two years. 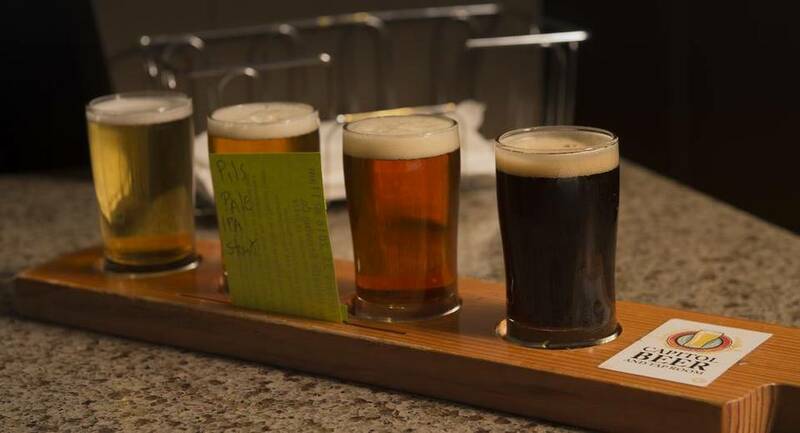 “Capitol Beer has pretty much become the beer geek spot in Sacramento,” said Dave Prillwitz, who has tasted and reviewed 8,300-plus beers on RateBeer, the popular website and phone app for beer fans. Hotchkiss and Aguirre opened the business in the summer of 2012 with big ideas but a shoestring budget. All of the equipment and furnishings were bought second-hand, and the setting in those early days was admittedly sterile. But word spread that this place was serious about its beer.